As craft brewing keeps gaining momentum, and many smaller and nano-breweries shift toward what's trendy, it's only a matter of time until a sea-change seems evident. Red Ales were once popular, IPAs continue to have there fair share of menu space, barrel-aging is having its moment, sours are gaining popularity... It makes the weary craft beer drinker wonder "What's next?" Don't get me wrong, none of the aforementioned are problems, so long as great beer is being made. But you can't help but think, sometimes, about getting back to the basics. The simple, the honest, the minimalist. Craft beer might be itching for that transitional shift, and one new Logan Square brewery just might fit the bill. Several years in the making, Hopewell Brewing Company is Chicago's newest brewery you've likely never heard of. Having existed as a brand – at least in online form – for the better part of four years, this shiny brewery-to-be (in a beautiful terra cotta landmark building) on Milwaukee Avenue is finally moving along, and quickly. For co-founders Samantha Lee and Stephen Bossu, this venture is a homecoming of sorts. After spending years in Champaign, Philadelphia, Portland and New York City, they are finally back to their hometown of Chicago to team back up with third partner/founder, Jonathan Fritz. The three met in school at the University of Illinois, and bonded over homebrewing and one massive summer cross-country camping trip. It was somewhere in between that the idea for Hopewell came to be. We dropped by the raw "Downtown" Logan Square space to get the lowdown on all things Hopewell, with Samantha and Stephen. We talk influence from all three coasts, lager-focused brewing, flagship beers, and a bright and airy taproom set to open in November. We've had Hopewell on our radar for a little while now. So to start off, who's the brewer of you three? Stephen Bossu: I am. My background is in brewing and brewing science. So I bring that side of things. I went to UC Davis – they have a really great program. There's a lot of money in wine out there, but in beer now also. It's like: Seibel [Institute] & UC Davis; those are kinda the two main options to study in this country. And you guys have lived in a handful of places around the country, correct? Samantha Lee: The three of us all met at University of Illinois. Then we moved out to Portland, Oregon for three years. Then, moved to New York. We were there for about three years, and now we're back here. It's been...a week back! SB: The two of us lived in Brooklyn, and I worked at Brooklyn Brewery actually. It's a good company, it was a lot of fun. So, now you are back in Chicago. Why Logan Square? SL: You know, we were always eyeing Logan Square. I think it took us so long to find a place just because we were looking specifically in Logan Square. To find the square footage we needed, the ceiling height, the right landlord – all of that. It took a long time. Also, our third partner, Jonathan (Fritz) has lived in the neighborhood since college. We're all from Chicago, and the neighborhood really spoke to us in terms of the community around here. It just seems like a great neighborhood to both live and have a business. This is definitely a neighborhood that is giving you more reasons to visit. SB: Yea, we also always wanted to have a public facing element, we didn't just want to be a beer factory. Otherwise we might've gone farther out, where you maybe didn't need the foot traffic. SL: I think it's a place where the three of us always wanted to live and live long term. And to have our business. So, I think that's the right fit for your business when that's the mentality. We heard the three of you bonded over a cross country camping trip...Is that where the idea for the business was spawned? SL: Probably, yea. That was a great trip. And we fit in stops to a lot of craft breweries along the way. Even though I was only 20 at the time, shh! We played around with homebrewing a little in college, too...it tasted fine. SB: Hah, it was ok.
SL: Well, there was one brew that was a surprise. We were brewing at my apartment, on my electric stove, and the power went out. At the time, you [Stephen] lived about a 20 minute walk from me. So, we just stopped, picked up everything, and walked it all over there to continue. We were just walking down the street with all these big pots and stuff. It was January. And it worked. I remember – it was an oatmeal stout. SB: That's problem solving, hah. But yea, that was the start of it all. How long have you actually had this space? SB: We've probably been talking with the landlord for about a year. Lease negotiations and trying to figure out the timing of everything. But a lot of it takes a lot of lead time – city permitting, TTB licensing, all the background stuff. And physical equipment takes a good amount of time too, of course. It's been all of that planning til now. That, and then design. It's kind of a blank slate as you can see. SL: Which is cool. It really is a golden opportunity for us. SB: At this point, we're shooting for November. I think we can hit that, but there are just a couple hurdles to get over. So that's for first beer, in the taproom; open to the public. It is still a bit early for the full conversation, though; we don't have beer – product – yet. Some people will dive right into brewing and then worry about their taproom later. It sounds like you guys are more conscious of having your product up front, day one. SB: I think a big part of having this taproom is having people come in and actually experiencing 'Hopewell.' And that's always been part of it. It matters what we're brewing and how people are experiencing it. And then, too, we can get immediate feedback from people right here. That's invaluable. SL: It's like a lab basically, which is awesome to get that. And it's also an opportunity for us to fully realize our brand. From the plants we choose to have in the window, to what color we choose to paint the exposed brick – it's those things that we see as part and parcel to the brand. It relates back to the beer we have. It's creating like this little terrarium, all part of this same experience. We're excited about it. SB: That is an option we've looked into. But that's really just because we can only do draft here. We don't have a bottling or canning line. So these would be options to get beer in package, but it really wouldn't be to get beer out sooner. It'd be to support the draft beer that's coming out of here. And we'll do growlers here too of course. So, I think you guys officially have the record for longest reply to an email. What was it, two years since we first contacted you? SL: Yeaaa. I was just gonna mention that! I think I remember, you guys reached out because you saw the work that [design firm] OMFG Co. did for us in Portland. And we are still working with them, they are really great. I remember at the time they had actually asked us if they could share the design work on their site. We were "Yea, sure! Oh wait, we're moving to New York!" So, during our time in Brooklyn, the Hopewell emails got a little neglected. Yea, you have to be conscious of how you want to differentiate yourselves as a brand. SL: Exactly. 'What does it mean to have this business?' You're taking up not just geographical, but visual space. Space in the market, online visually, the storefront..it all speaks to how we act as a company and the best practices we're going to initiate. How do we approach our beer, our waste management, our hiring? – I think we've all matured on these topics. So, yes, I think that break was really needed. We've refined a lot. It's kind of an exciting prospect for you guys – you're flying a bit under the radar as a brewery, while you're planning. And then you are going to be open relatively soon. SL: We're still just getting used to talking to people who aren't friends or family, about Hopewell. Because the two of us have not physically been here in Chicago until just now. Jonathan has, and he has done a really great job of talking with people. But, we're sort of still getting comfortable – this is it, this is our space. It's exciting! SL: It's an old Goldblatt's Department Store. From here all the way up to Diversey was one building. Then it got subdivided up. It has a historic facade too, all terra cotta. It's a landmark building. And with the basement you have here, another full footprint of the space upstairs...that's incredible. You're not finding a space like this in New York. SL: Plus, this is where we're from. Our moms are happy about it, hah. The plan is to be lager-focused brewery, correct? SB: By no means is that going to limit us, but that's always been the thought. Lagers, when they're well done, are just so great. So, we definitely wanted to focus a bit on that. Plus, there are fewer great craft lagers out there, versus some of the other styles. It's also not gonna stop us from make a couple great IPAs to start, too. Crowd-pleasers, for sure. And "IPA" is about as broad of a category as you can get. SB: It seems like you can almost call anything an IPA, right? But yea, it is fun. With malt you have this great paintbrush that you really can do so much with. But with hops, it does come down to varietals. You can say, "Oh that flavor, that's Mosaic." Or whatever you want to highlight. SL: And living out on the West Coast versus the East Coast, we've tasted so many different IPAs. I think that's why we want to do two. Because there are so many different ways to do IPAs – we have some different things we want to try. How many beers will be on tap on day one? SB: We've got five listed, but that's just because that's as far as we've gotten, with all the other planning still. But we've got a lot of things in the works. And having the bar here will be such a great way to get as many beers out as we want. And playing around with sours is also a route we want to go - that more specialty realm. SL: We'll have those staples, and then some experimentation. There's something about just sitting down to a good lager. What's in the name? You obviously settled on it a long time ago. SL: We did, but we went back and forth on a lot of things, some names you might expect for a brewery. But we decided we wanted something that didn't have inherent meaning on its own. We really love our name, Hopewell, for it's ability to mold into our own conception of our brewery and the kind of business we want it to be. It's super positive and welcoming. We found the name in researching the Midwest, coming across the Hopewell Exchange System, which is an ancient system of trade; raw materials from across North America were transformed into goods to be traded. At the core, we love our name for the simple reason that we can control its destiny from the beginning. We came across it via the Hopewell Exchange System, but at the same time we really want to avoid appropriating culture or heritage, even if it is from over 2 millennia ago. How is the design process going for the brand? SL: We're still working with OMFG Co. out in Portland, making sure everything is how we want it still. We've dragged the process out a bit, but it's nice to have that hindsight. The three of us are all really picky, but we trust OMFG. 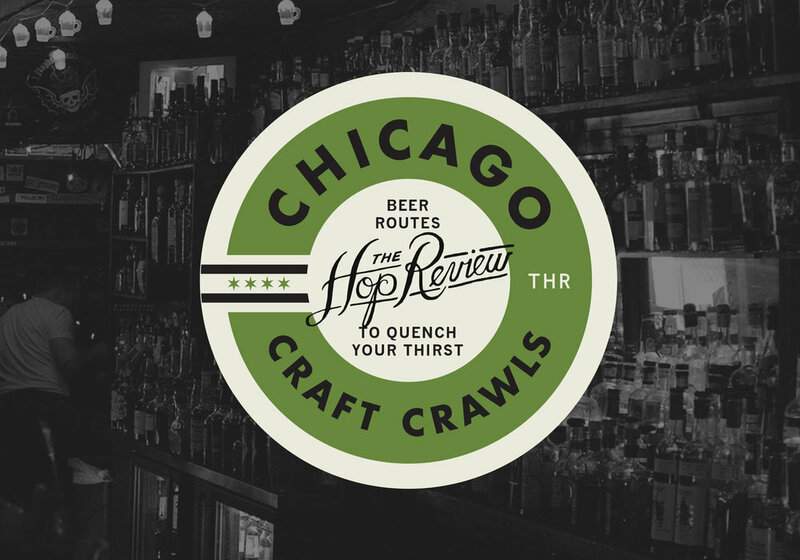 Plus, the beer landscape in Chicago has really changed the past few years. So, we can respond to that, too. We're excited to differentiate ourselves visually. We're thinking "Why don't we explore pastels, something brighter?" Something that will help us stand out a little more on the shelves. And then, too, the space in the taproom will be bright and airy: white oak, lots of white. SB: Yes, this isn't going to be a dark bar. That sounds like a refreshing take. SL: And we're working with a local carpenter, who's done work with The Promontory in Hyde Park, Thalia Hall in Pilsen and several other spaces around town. He has great vision, and he is really helping us up front in the taproom. SB: Getting past all of the structural part of the build, and getting to pick out finishes is a lot of fun. It makes it a lot more "real." We had kind of vague selections for a while, and we're finally narrowing down specifics finishes. SL: We're going to leave as much intact as we can, and still keep that bright feel. So there will be some concrete and this unique gypsum stamped wall. I also love having plants indoors. Plus, a lot of communal seating, with some two-seaters. The key word is "brightness." So what does Hopewell look like a year from now? SB: A year from now, if we've done it right, this place will be brewing as much beer as we can. We'll hopefully be trying to figure out how we're fitting more tanks in here. We've bought ourselves at least a year, before we'll see if we can expand a little. And how big is the brew system? SB: It's for a 20-barrel batch. We're not limited by the brewhouse, it's just by how many fermentation tanks we can fit in here. And like we said, it will be draft only, at least to start. We'd love to get some beer into package; bottles, cans – but even the 750mL bottles, that's a beautiful way to get beer into bottles. Alright, what's in the Hopewell Brewing folks' fridge at home? SL: There's actually some Ale Syndicate in there right now. That's the only thing in our fridge; we just moved in. But, I love Flanders Red. That's my beer. Particularly the Duchesse (De Bourgogne). SB: I find myself drinking a lot of Srirachi Ace. That beer is just so good. It's so good. I know it's a cop out, because I worked there. But, it's hard to beat that beer.